We are well-reckoned Ruled Paper Manufacturer, Exporter and Supplier. 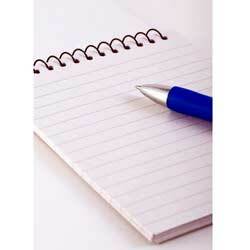 Our Ruled Paper is widely used in diverse applications in education and office stationery. The Ruled Paper is manufactured under the strict supervision of experts. Moreover, our Ruled Paper has high tensile index and therefore widely acclaimed by the clients. We offer the Ruled Papers in diverse thickness and sizes to match the clientâ��s requirements. © Copyright 2012. Tirupati Balaji Fibres Ltd.